The model 4711 Delay-On-Break is intended for operation in applications that require the initiate switch to be located a long distance from the actual timing module. 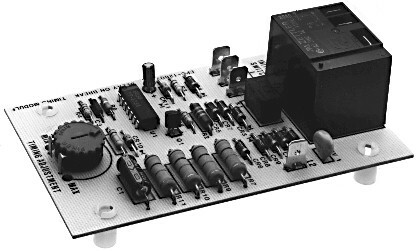 The model 4711 isolates the initiate circuitry from the timing control circuitry through a small on board interface relay. When the initiate switch is closed, the output relay energizes and remains energized until the initiate switch opens and the delay period expires. If the initiate switch is closed prior to the end of the timing period, the timing period is reset. The output contacts provide service to 20A. Operating Voltage 12, 24, 48, 110V DC, 24, 48, 115, 230V AC, 50 / 60Hz. Output Rating Contacts SPDT, rated 20 amperes inductive, resistive. Timing Range Adjustable, see Delay chart below. Recycle Time 50 milliseconds after a timing cycle has been completed, the initiate switch may be closed.